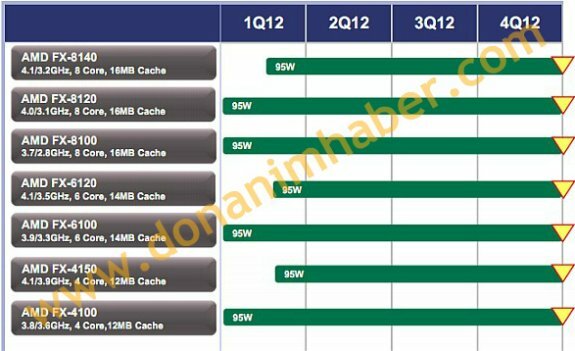 TPU reports AMD will introduce three 95W TDP FX-series processors in March. The FX-4150 features a base clock of 3.9 GHz (4.1 GHz Turbo) and 12 MB of cache (4 MB L2 + 8 MB L3) while the FX-6120 has its cores set to 3.5 GHz (4.1 GHz Turbo) and packs 14 MB of cache. As for the FX-8140, it's clocked at 3.2 GHz (4.1 GHz) and has 16 MB of cache. All three models have an AM3+ package and are made using 32 nm process technology. No word on pricing yet.